What makes Diana Wynne Jones so magical? What keeps me coming back to her books for multiple rereads? Yes, her crazy complicated plots. Yes, her vivid characters. Yes, her fantastic imagination. But how about her wicked, wicked sense of humour? DWJ has a sense of the absurdity of life that colors everything she writes and says. At the back of the 2007 Harper Collins paperback of Charmed Life is a fascinating little interview with the author—it’s worth finding. She describes writing the first chapter of Charmed Life “on paper covered with muddy paw prints and with a pen that bent and spread and splattered” in a “newly built house that had everything possible wrong with it”: “My writing of the book kept being interrupted by such things as water pouring in around the light fitments, the loos flushing boiling water and huge cracks appearing in the beams that supported the second floor.” You or I might find such circumstances frustrating or disheartening: DWJ turns them into a story. The people who knew her say she was a lovely, warm, funny woman. Neil Gaiman called her “the funniest, wisest, fiercest, sharpest person I've known, a witchy and wonderful woman” (in this blog post, which you should read.) The humour in her books bears out this description: she can be silly—think of Chrestomanci’s dressing gowns, or Sophie and her hats—she uses slapstick—like the Willing Warlock and the invisible dog in Mixed Magics—her magic can be so weird and unexpected and just plain fun—The Ogre Downstairs is full of great examples—but she can also be scathingly satirical. Notice that her villains are terrified of being made ridiculous, while her heroes learn to be perfectly comfortable with oddity and goofiness. 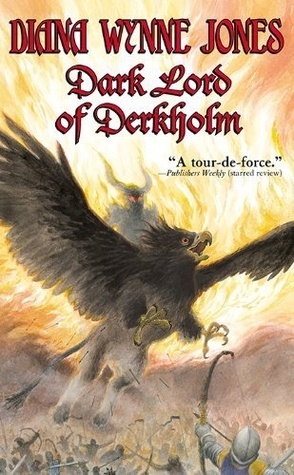 One of her funniest books is less well-known, but it’s of my favourites: The Dark Lord of Derkholm. It is a spoof of well-trodden fantasy tropes and a satirical skewering of tourists in search of “authentic” experiences. It’s also a fun adventure, a suspenseful mystery, a coming-of-age story and a family drama. Mild-mannered wizard Derk, who loves nothing better than to tinker with genetics—half of his children are griffins—is chosen to be this year’s Dark Lord for Mr. Chesney’s Pilgrim Parties, who have paid to get the complete fantasy experience on their Grand Tour of Derkholm. Derk’s son Blade is chosen to be Wizard Guide, even though Blade is too young and inexperienced. Things get wildly out of hand; everything goes seriously wrong; love, loyalty and logistics are tested to the breaking point. There are so many levels to the humour I find myself grinning foolishly and barking out into laughter at inopportune times whenever I read it. I wish I could quote from it, but I’ve lent my copy out and my library doesn’t have one, so you’re just going to have to read it for yourself! I also love the sequel, The Year of the Griffin, which skewers higher education and has some really hilarious assassination attempts. I think a person with a sense of humour is a person with perspective and humility, someone who can be kind and tolerant with human foibles but doesn’t put up with hypocrisy or pomposity. I think every one of DWJ’s books exemplifies this outlook on life. 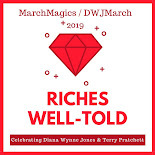 If we get to meet our heroes when we die, I hope I meet Diana Wynne Jones. Kim Aippersbach is a writer, an editor, a mother of three. She is hopelessly addicted to reading. She thinks Vancouver is the best place in the world to live, except when it rains. Her blog is called Dead Houseplants, www.kaippersbach.blogspot.com, but no plants were harmed in the writing of it. --Then all at once there was a roaring so much louder and deeper than Kit's that it seemed to come up from the earth and down from the sky at the same time. It came from all around, as if the whole world were roaring. Something massive and dark passed over Blade's head in a surge of hot air and hit the tipped-up dome of magic. SLAP. The dome fell back into place with a wallop that shook the turf under Blade's feet, tumbling yelling soldiers in a heap down the wall behind it. The massive shape wheeled above the dome and swooped down upon Don and Kit. The great roaring became words. GET BACK INTO THAT DOME, SCUM!" Flames flicked as if the words were on fire. Darklord of Derkholm also has some truly scary and touching bits in. Can't recommend it and Year of the Griffin enough! Thanks for the quote, Goldeen! Yes, I think DWJ has met a dragon or two in her life. She and Robin McKinley really get dragons. "Notice that her villains are terrified of being made ridiculous, while her heroes learn to be perfectly comfortable with oddity and goofiness." Love this on so many different levels!! I'm still a newbie to DWJ, but this one sentence really captured what I have read so far and loved about her writing. 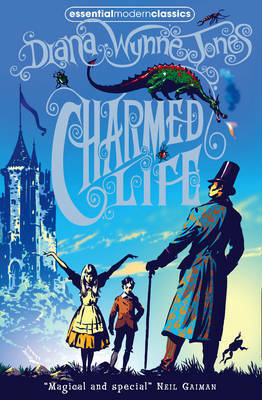 I am just about to read Charmed Life, so this was a fun post to read. I don't have the Dark Lord of Derkholm, and yet I know it and the sequel have been on my list for so long. Thanks for the reminders about how good they are (and she was). My copy of Charmed Life has a postscript by her, but it's a different one, about how she came to write fantasy, and how her children helped her. Charmed Life came to her one day when she was ill with a virus, and wrote itself in front of her: "To this day, I can recall my amazement at the speed with which the book then spread out from it (the central scene just described) forwards and backwards, zip-zip, as quickly as that, bringing with it Chrestomanci, Gwendolen, Mrs Sharp, the Nostrum brothers, Mr Baslam, Will Suggins and an entire world in which magic was as normal as music. The whole book was in my head in seconds. It was all utterly obvious to me." She had already written 5 books with magic in them, but she was thinking "she had to explore further since there was all kinds of magic and ways to write about it, and she hadn't found the right way to write it." I think the rest of her life was exploring how to write about magic, and she's left a wonderful legacy of books behind. The more times I reread the Derk books, the more they move toward being my favorite DWJ books. Although I just read them last year, I'm ready to pick them up again!